The visual effects legend looks back at the film that started it all. This article is part of a special StarWars.com series in honor of Star Wars‘ 40th anniversary today, May 25. 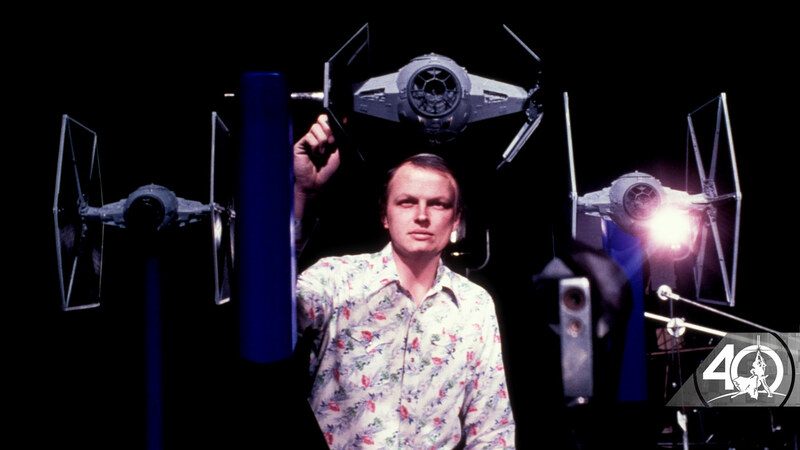 If there were a Mount Rushmore of Star Wars greats, Dennis Muren would have a prominent place. 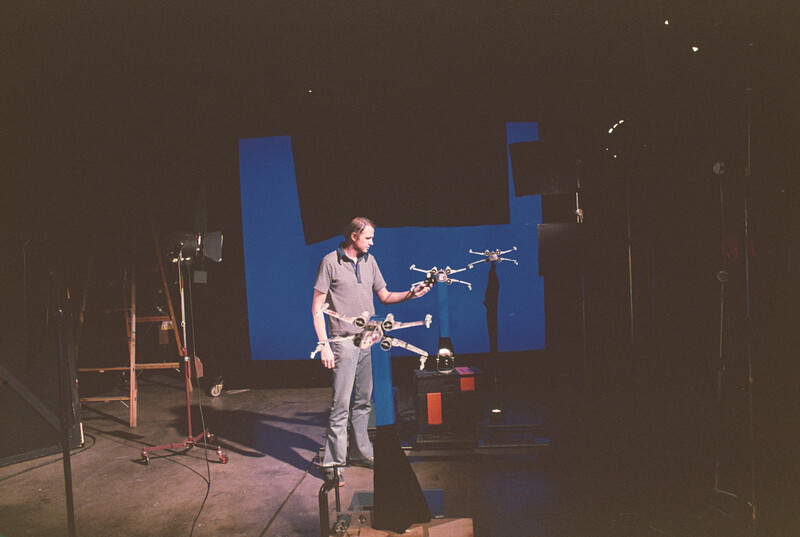 Muren has been with Industrial Light & Magic, Lucasfilm’s effects division, since 1976; as such, he has led or played a part in major advances in visual effects, from the groundbreaking optical heights of the original Star Wars trilogy to the shockingly realistic digital dinosaurs in Jurassic Park. 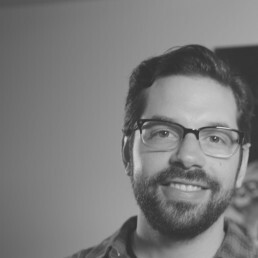 Today, he is ILM’s creative director, and a true living legend. 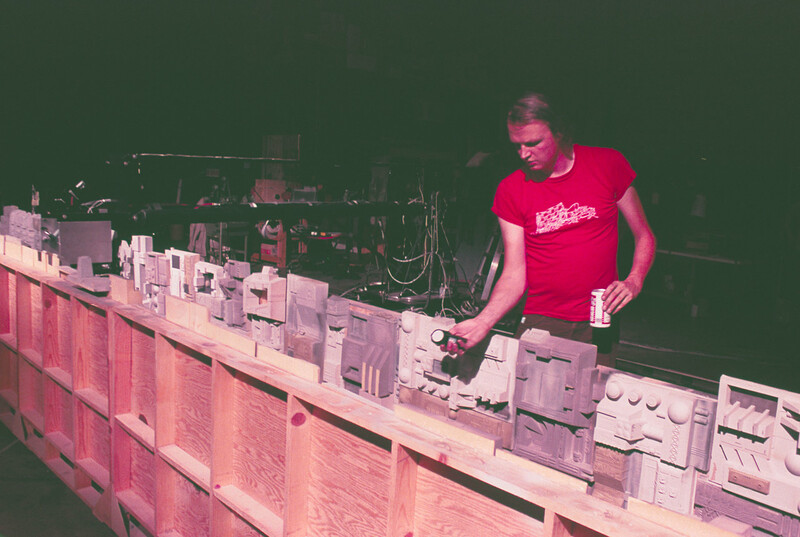 In celebration of Star Wars’ 40th anniversary, StarWars.com spoke with Muren about his work as an effects cameraman on the film that started it all, 1977’s Star Wars: A New Hope, discussing how he got the gig, the techniques used to create the movie’s innovative effects, and the saga’s continuing impact. StarWars.com: How did you come to arrive at ILM and get involved with Star Wars? Dennis Muren: Well, I was working at a company called Cascade [Pictures] that was doing effects commercials, and I had been working there on and off for years. 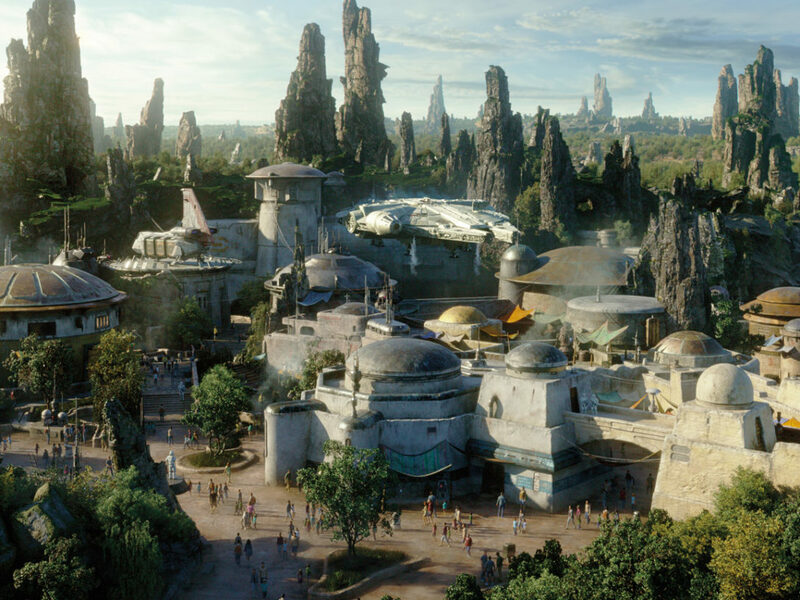 They closed up, and I had heard that George [Lucas] — and I didn’t know George — was doing a space film and I thought, “Oh that would be pretty neat to work on.” I contacted somebody, I can’t remember who it was out there, and got an interview with [special-effects supervisor] John Dykstra and [1st cameraman, miniature and optical effects] Richard Edlund. They were not shooting anything. 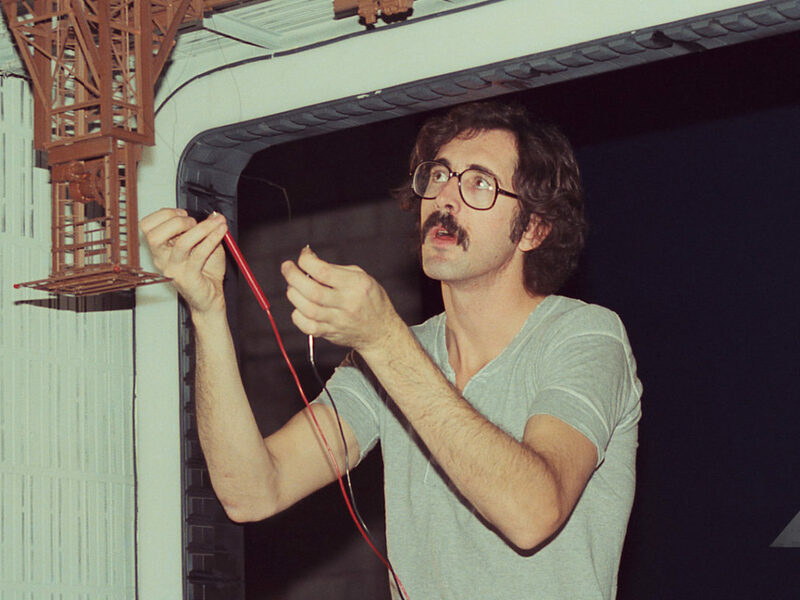 They were just building the models and setting up in Van Nuys [in Los Angeles, California]. I showed them my work. I sort of sold myself as an effects cameraman, even though I just saw myself as kind of doing everything. But in Hollywood you’ve got to put a stamp on yourself because they have to fill a slot. So that’s the slot I figured out, and I got on the show, never expecting that it would turn into a huge hit at all. 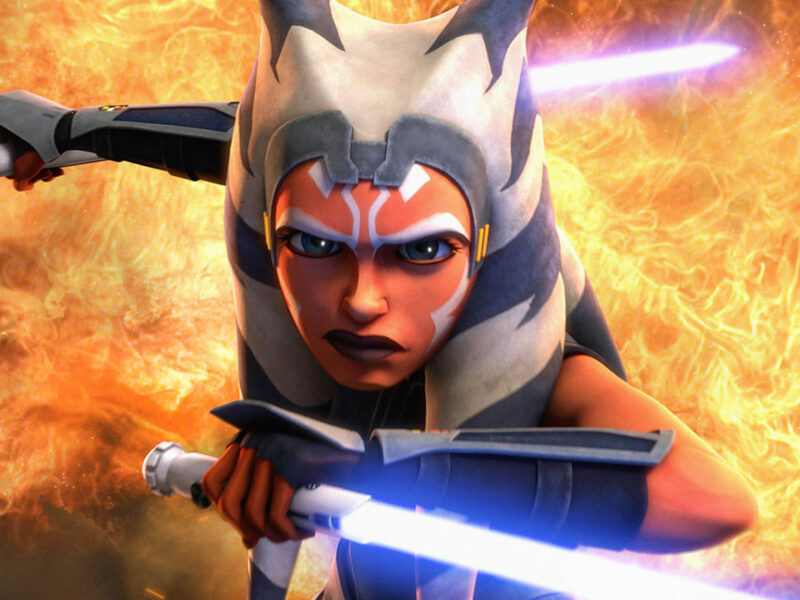 StarWars.com: Did your role expand from what you pitched yourself as? StarWars.com: So that’s my next question. 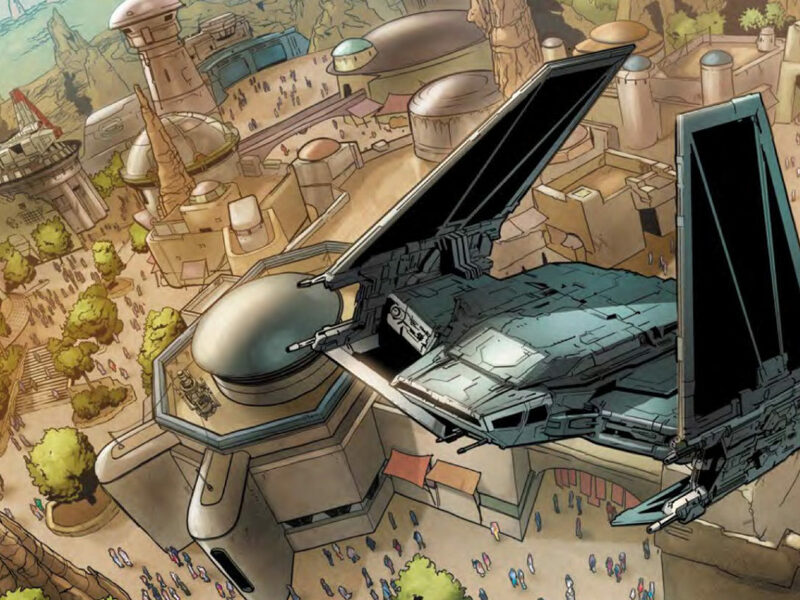 Once you got there and started getting involved, what did you think of it and of what George Lucas was asking of you guys to accomplish? Dennis Muren: Well, I probably didn’t see George for three months because he was in England shooting. So I was dealing with John or Richard and the other guys that were around. There weren’t that many at the time, maybe 30, maybe less than that. Just setting it up, and they were building this camera equipment and it just seemed to take forever to get it done. So, on some of the equipment they had, I would do camera tests to make sure the lenses were working, and tests on lighting. Part of the trench model was made, some of the ships and prototypes were made, and I’d shoot either on some sort of movie film or stills to be able to get them on film to look at them. They were buying time until George gave them cut sequences, so that they could start shooting the effects, because they didn’t really know what it was. We tried to do a bunch of front projection, or to deliver background plates, for the gun-port sequence of TIE ships flying around. We actually shot those, and they were going to do it over there, front projection [in England]. But there was no way that the actors really had time to see the projection, the TIE should go by, and then pan with it to make it look at all real. So that all got thrown out and got replaced by blue screen. And then you can sync it up exactly right and they can pretend they’re seeing something. It was much better than actually trying to get it on the set, but George was trying to. So that’s the first stuff we really turned out, but it wasn’t in the film. Then slowly, when we came back, we just jumped into it and started doing stuff and the equipment ended up getting built. It was all futuristic stuff. It was slow-speed cameras — everything controlled by motors controlled by a computer, and 11 motors or so for the camera to swing left, right, up, and down. Boom arm, tracking forward and back, and all this sort of stuff. StarWars.com: Was this the Dykstraflex? Dennis Muren: Yeah. They had another version that was made with one of the old Technorama cameras from Technicolor that shot VistaVision also, that didn’t have the boom but it had all the other capabilities. What I didn’t realize, actually, until the show was over, was the incredible power that that gave you to design the shots, because there were no accidents. Everything had to be figured out, just like in CG. You had to figure out exactly how you wanted this camera to move, how you wanted the model to move, how you wanted everything to work. But you could then make any image you wanted, as long as you shoot the separate elements — all separate and you could combine them later on. It was phenomenal. That was just a real eye-opener for me. The guys [also working on the film] were completely different, personality-wise, than I was. I was more of an introvert, hands-on kind of person, and these were like, weekend race-car drivers and motorcyclists that were having a good time. I was like, “Oh, we’re never going to get the film done!” I mean, everybody was worried about that. I was just different. I brought Ken Ralston in — and he was very much like me — to be my assistant on it. Then later on, I got Phil Tippett and Jon Berg in, and other guys for Empire [Strikes Back]. Really, going all the way through the show, I had no idea it was going to be a success. It was too weird. The script, you know, you’ve got these guys running through these corridors in some sort of space planet and a guy’s dressed in a dog costume running along with them, and there’s this robot like the Tin Man in Wizard of Oz. It literally seemed like that, because we only saw little bits of it. George wouldn’t show us very much, just still photos. You’re just thinking, “What is this? Well, it’s interesting.” I really admired George for THX  and [American] Graffiti and that’s why I wanted to do the show. One of the main reasons was to meet him and work with him, and damn it, if he didn’t pull it off! [Laughs] It was amazing — absolutely amazing. Dennis Muren: It still worked. [Laughs] The crowd, half of which were people that had worked on the film, the other half were their husbands and wives — when that ship goes over in the opening shot, they started going crazy. StarWars.com: I’m curious. It sounds like you didn’t know if it was going to work as a movie until you saw it, or if the effects were really going to work. But the impact of the effects in Star Wars was so massive. Did you have a sense while you were working on it that you were doing something new, that this was going to change things? Dennis Muren: No. I knew we were doing something different. I didn’t necessarily think it was going to change things, because I didn’t think it was nearly as realistic as 2001, which was done the same way, but without all the flexibility of the cameras and the blue screen, and that looked just phenomenal. To me, even in seeing the work in Star Wars while we were doing it, most of the shots looked very crude. The ships were doing funny maneuvers, they don’t seem to be responding the way inertia would actually move something, and there’s just huge matte lines in some shots. We didn’t have the time. It’s amazing that some of those shots are even in the show because it was such a rush. Things were changing all the time in the edit. New shots were needed and stuff like that, so we were working 24 hours a day there near the end. But I didn’t see that until it came out, and I was just as surprised as everybody that the effects had this huge response. I still don’t know if I have an answer to that. I think maybe I was just seeing the mechanics of everything, and the public is comparing it to other movies with spaceships where everything is static camera. But I didn’t think the public would care about that. Another possibility is they don’t care about that stuff. They’re following the story. That’s all they’re doing is following the story, and it’s so compelling. If you could tell the story, no matter how real it looks, then when you ask them to explain it back to you, there’s no words for that stuff. So they tend to say, “Well, the space battle was amazing,” but they really don’t mean that. They really mean the speed that Han escaped from the Death Star at the end was phenomenal, but they don’t know well enough to say that. So I still don’t really understand it. StarWars.com: I just think of that shot from the X-wing’s first person POV, going into the Death Star trench, which still looks good today. I don’t know that any spaceship in film before that ever looked like it had moved that fast. Were you able to recognize things like that as being kind of a leap? Dennis Muren: No, I wasn’t. Isn’t that crazy? I should have. [Laughs] I knew the mechanics so much. Once I figured out the mechanics of what we were doing, we could do anything. So that was just another thing. “Sure, we could do a shot like this.” I was seeing so much, especially at my age back then. Not so much seeing the whole thing, but seeing the technology and having to adjust to a whole new technology that nobody knew how to use, and figure out just how to get through the shots. I wasn’t far enough back from it to see what the public was going to see, and that’s often the case in shows. It’s the director that knows that, because he’s writing it, hopefully with a clear mind. The effects people often can’t tell until they see the movie. But I think other people did see it and loved it, that were working on it. Dennis Muren: I felt sorry for him as it was going on, and the shots weren’t coming out because the cameras weren’t ready yet, or other stuff wasn’t ready yet. We just couldn’t really do it. We needed a production manager in there, and we got one. I forget when it was — September. They brought in a guy named George Mather, and he just took charge. He said, “Okay, the Dykstraflex. We’re not just going to use it in the daytime, we’re going to use it day and night.” I took the night crew, because Richard wanted to use it in the daytime, which was great because it was actually like 4 o’clock to midnight. So it wasn’t horrible. But I was uninterrupted, so I got a lot of work done. We did that with all the cameras and that more than doubled production right there. He had a background in filmmaking and knew how to do what George did, and agreed with George and [producer] Gary [Kurtz] that we’ve got to get the show done and you can do it. You have to believe you can do it. That whole thing with the Force is kind of George. There’s something to it. Not that there’s a cosmic thing. He may believe that, I don’t know, but the thing about it is “don’t give up.” That’s really a true thing. If you can believe you can do it, you usually can think about it and figure out a way to do it and sure it up. He used to say something. “There’s nothing wrong with getting in trouble, but there’s plenty wrong with not getting out of it.” And we were in trouble and it took the producers to get us out of it by bringing George Mather in, and it totally worked. Dennis Muren: This is just one of the many shots where you’re flying in on the Death Star, when they first see it. There’s about five shots where they’re approaching it, getting closer to it. 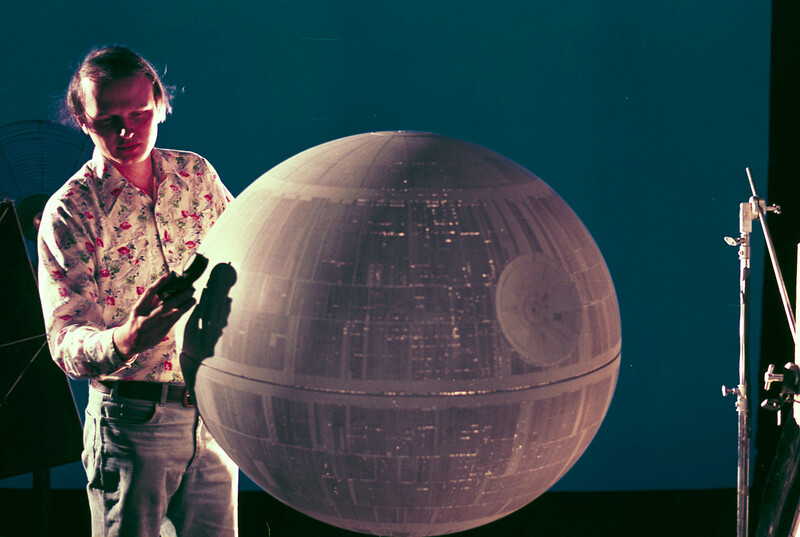 This is shooting one of them, and it’s getting the exposure on the highlight of the [Death] Star. Then on the dark side there’s this card over here to bounce light on it. There’s another slightly weak front light, and it’s shot against a blue screen so we can put it over something else. StarWars.com: Why make the model that massive versus the size of the other models? 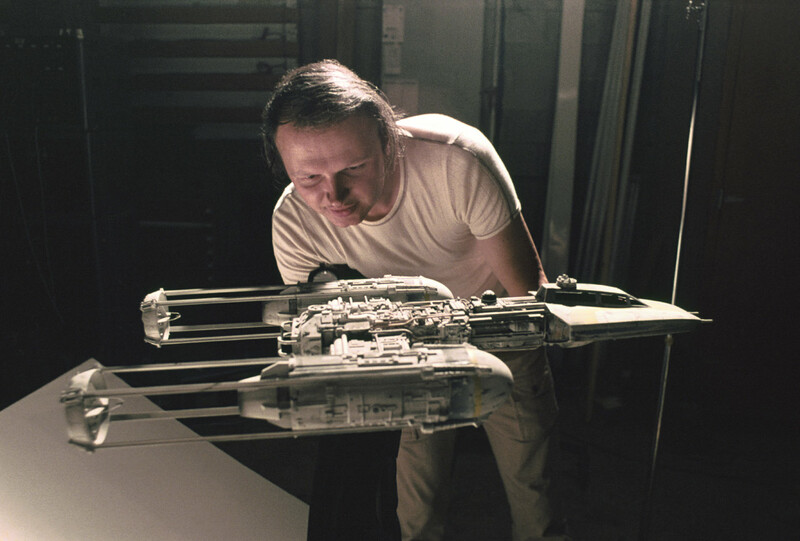 Dennis Muren: I had nothing to do with the size of the models at all, but this needed to be that size to get these little tiny marks in it. What you’re seeing here is half a dome and behind it, there’s a piece of frost, I think it was — material we had hanging back there, and then lights hitting it from behind that you can’t see either, back there. So you’re looking through paint — Ralph McQuarrie did a lot of this — and going in with a little razor blade or Exacto knife and scraping the paint off and seeing a backlit white, something behind it. That’s what you’re seeing. But if the model were only this big, you couldn’t make the etching back then, you couldn’t make it that small. And also just to be able to carry focus, because we did get pretty close to this Death Star for some of the shots moving in, and we had to be able to carry depth of field. 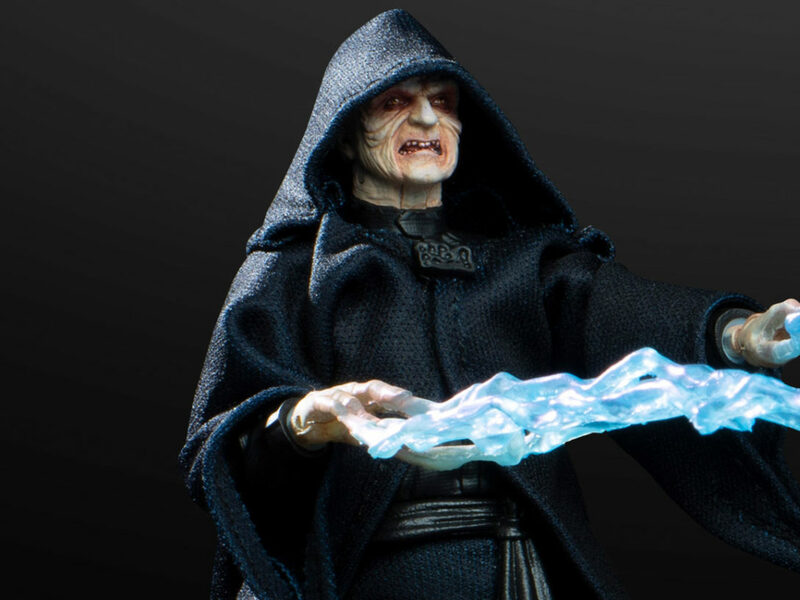 StarWars.com: Would you get involved with tweaking a model if it wasn’t working for what you were shooting? Dennis Muren: Oh yeah, and there were times where it would seem like there weren’t enough lights on the edges — you can kind of see that problem here — and you may go and make them a little bit bigger. Either I could do it or get Steve Gawley or one of the model guys over here to do it. And George was all open to that. We did it with X-wings and everything. StarWars.com: Vader at the Death Star. Dennis Muren: Yeah, flying through the trench. It’s just one of the trench shots. Because we were so far behind, the idea was to shoot each of the ships separately so they could have different flight paths. But there was no way that was going to get done, so I started this and we ended up doing it a lot — shooting as many ships as you could at one time, and putting one or two of them on their own separate tracks. So this ship may just be doing this, this one may be doing that and rolling, this one may be static and rolling, but not moving anywhere because we didn’t have enough tracks, but the camera’s doing all of the motion. And it’ll look like they’re all separate. That sped things up tremendously and I could get two or three shots a night like this, with multiple ships. Dennis Muren: Yeah. As long as the shots look good, George didn’t mind. 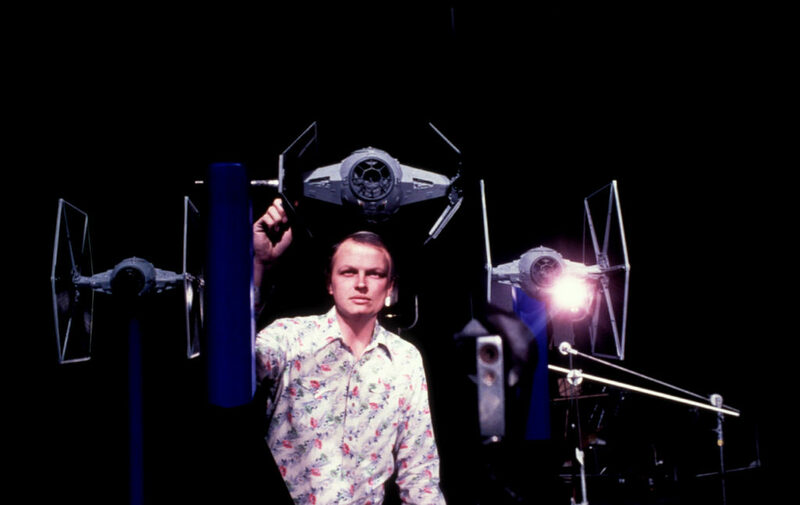 Dennis Muren: Well, he had the footage cut that he together for the gun port [sequence], and also for the space battle, from footage he got from TV and World War II documentary stuff. That was the template, and from that [effects illustrator and designer] Joe Johnston did the storyboards. But the speeds were never fast enough. So he would always say, “Make them faster.” Richard had a better idea of what fast meant than me, so he would shoot something and sometimes the background would be going so fast you couldn’t even tell what it was. A lot of the time George would say, “Great! That’s what I want.” I would think, “What the heck’s he talking about?” So I’d do something much more timidly, because you know, I never drive more than 40 miles an hour in L.A. anyway. “No, it should be faster.” [I’d say,] “But you’re not going to be able to tell what it is.” “Well, just try it, that’s okay.” So I’d try it, and by the time you crop it into a shot, with an X-wing just static in the foreground, you realize… You’re panning the camera and you’re starting to look at the world in layers, which he was doing editing it. I was always a spatial person. I never dealt with layers. I built models and stuff, but they were always right in front of me. So I never got that. StarWars.com: But by the time you did the speeder bike chase in Return of the Jedi, you were the speed master. Dennis Muren: Way before that. Ending the show and working on Close Encounters, and especially working [Battlestar] Galactica, is really where I put all that stuff in place and I started realizing the control that you had for speed and emotion. By that time, I could understand the flying into the trench shot, the power of it. Instead of just being a technical challenge, it was a powerful design thing. That’s all stuff John understood and he pushed for the system to make it, and he totally got it and really delivered on it. StarWars.com: You’re talking about the Dykstraflex. Would you say that’s the big innovation of A New Hope? StarWars.com: These, you could blow up! Dennis Muren: These, you could blow up and you could drop them and then, “Here’s another one!” Also, they’re going so fast, you don’t need to make them any other way. So I think that was a big deal. 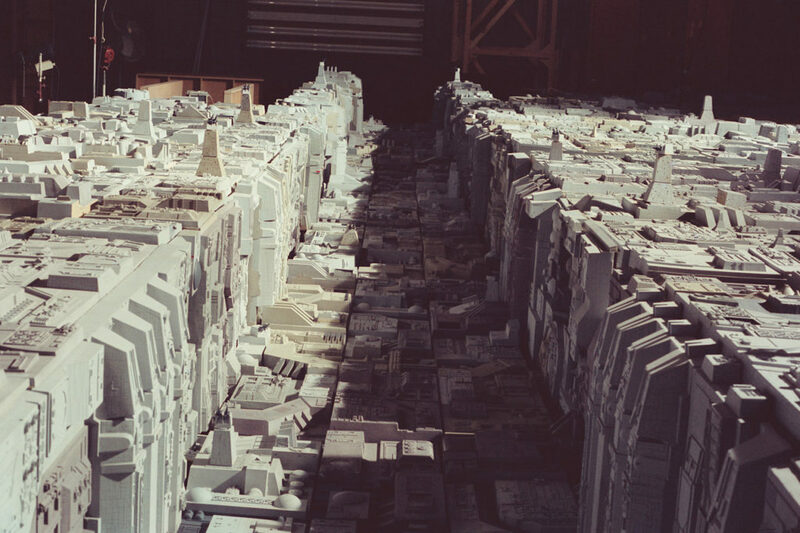 That’s how the pieces of the Death Star were made, all those modular Death Star pieces. You look at Logan’s Run, which was made a year before Star Wars, and even [1976’s] King Kong, but especially Logan’s Run with model sets and all, and you see what old-school Hollywood was doing and the weaknesses of everything in that. And you look at a whole different mindset for everything, and that’s what Star Wars was. StarWars.com: Is that a beer in your hand? Dennis Muren: Probably. This must’ve been after a party of some sort. This is getting an exposure for a test we were doing. There’s the ‘flex back there going down, and the track is right back there, you can sort of see it. I’m just getting the exposure. Do you have any photos of the wider trench? That was really interesting. You know how you had the multiple passes of going down the trench? Each time, for more drama, the trench was going to get narrower as he went down a different area. We built the wide one and we built the small one, but we never built the middle one, because by then [George] said it’s not necessary. You couldn’t reuse shots that way, either. The narrow one, which is what we did most of the testing on, had so much more energy because you were closer to the walls. It just made sense to just have that be used for everything. StarWars.com: When it came time for Empire, which had very different effects — more stop motion with things like the tauntaun, and shooting on snow and white backgrounds — did the experience of working on Star Wars make you feel ready to take on things like that and move on to even more challenges? Dennis Muren: Yeah, then I could do the stuff that I wanted to do, which was big sets in front of the camera and not just blue-screen compositing. So I loved that. That was the hardest show I ever worked on, though, because we moved up here, we had to find as much local talent as we could, and then we had to train them. We needed more equipment because there were many more shots. And it took longer, as always, to build the cameras and all that stuff. That was a really tough show. 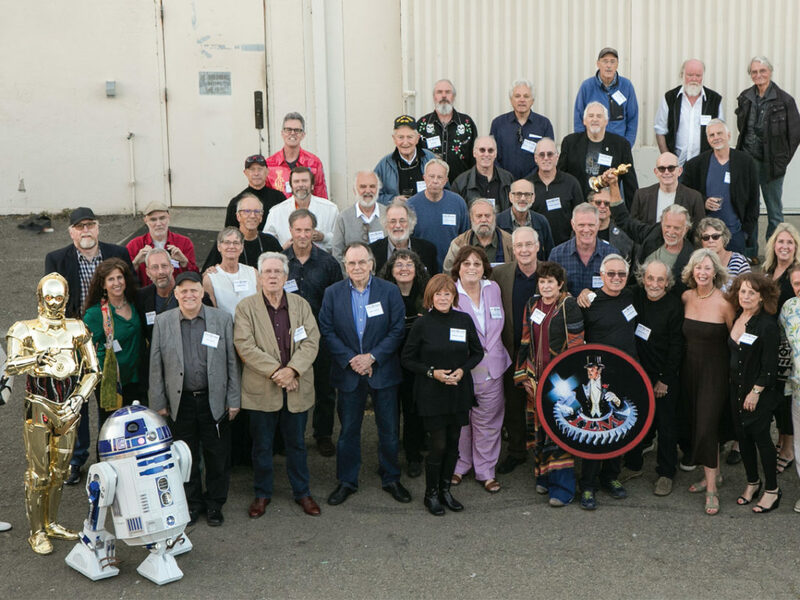 StarWars.com: So, 40 years later. A) Can you believe it’s 40 years since Star Wars came out? StarWars.com: And B) When you look back, what does it mean to you personally, the legacy of Star Wars and the work that you did on it? Dennis Muren: It’s so amazing, because as I was growing up there was no future in any of this stuff. I loved it so much, but there was no future in visual effects. You couldn’t learn it anywhere, so I never saw a career. But that’s all I wanted to do. And then to have all this stuff coming together, which I think was people my age growing up on television, getting used to changing things quickly on their TV, and graphics, being able to see that stuff. Tying in with George who had these stories that were similar to fantasy, wanting to make movies about them, and Steven [Spielberg] wanting to make movies about them, and the other people that were similar. The cameramen who were trying radical things. Everywhere, there were people from that ‘60s period that were trying different things. It only worked because the actual people wanted to see the movies, which were essentially the same people that were making them. Which was pretty neat that that all happened, and if it hadn’t, Star Wars would have come out like 2001. It would have sort of been there and it would have been talked about, “Oh, that was really good, the effects were really neat,” and then gone, and there never would have been this industry, ever. Until something happened. It wasn’t really an accident, because George and Steven, within one year, did Star Wars and Close Encounters. So it really was our whole generation got there and were ready, and the people that weren’t filmmakers were ready to see them. Those films. But it’s kept going. Then with computers, it got into video games and got into all this other stuff. Virtual reality, now. All kind of based on this synthetic reality, and cheating things around to make them look like what they really aren’t, and having your mind available to being open to seeing new things. And then people having things in their mind that they want to show other people. StarWars.com: Having been part of so many innovations in visual effects over the years, when you look back at Star Wars, in terms of impact versus other films, where would you rank it?